Description: The stories of such women as Rahab, Deborah, Jael, Delilah, Jephthah's daughter, and the Levite's concubine raised thorny questions for nineteenth-century female biblical interpreters. Could a Victorian woman use her intelligence to negotiate like Rahab? Was the seemingly well-educated Deborah an appropriate role model? Or did Jephthah's daughter more correctly model a pious woman's life as she submitted to her father's vow? This unique volume gathers select writings by thirty-five nineteenth-century women on the stories of several women in Joshua and Judges. Recovering and analyzing neglected works from Elizabeth Cady Stanton, Harriet Beecher Stowe, and many others, Women of War, Women of Woe illuminates the biblical text, recovers a neglected chapter of reception history, and helps us understand and apply Scripture in our present context. 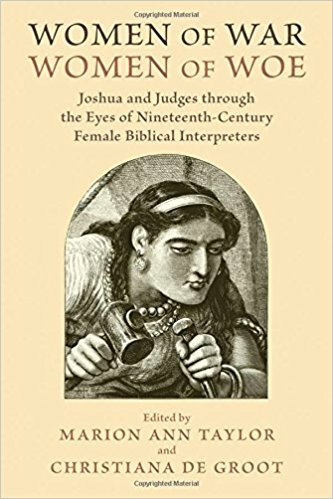 Citation: Susanne Scholz, review of Marion Ann Taylor and Christiana de Groot, eds., Women of War, Women of Woe: Joshua and Judges through the Eyes of Nineteenth-Century Female Biblical Interpreters, Review of Biblical Literature [http://www.bookreviews.org] (2018).